January, the month of new beginnings and high goals, is coming to a close. Have you started the year with a resolution to buy less, buy more mindfully or not buy at all? How do you stick to your resolutions while the sales are on to tempt you? Will you wear the item at least 30 times? Will it fill a gap in your wardrobe? Sound advice. But how far does rational reflection take you once desire has kicked in? In a recent episode of the sustainable fashion podcast Magnifeco, designer and fashion theorist Otto von Busch talked of the difficulty in bringing about a sustainable fashion. As he says on the podcast: awareness is not enough. Drawing a parallell to food, von Busch points out that even when we are aware that sugar is bad for us, the craving for the snickers bar is still real, and in fact extremely hard to hold back. He suggests the same emotional responses are present in how we relate to fashion. For, in a visual culture, continually re-inventing ourselves through fashion and social media is a way to feel acknowledged and loved. And we all want that. How do we then deal with an unsustainable cultural desire for fashion? Von Busch suggests we need to build other social reward mechanisms. We need to train building our self-worth in other ways than through the feedback loop of social media likes. It is a fact that a lot of marketing tries to get straight at your deepest emotional needs. The Maslow theory, with the well-known hierarchy of human needs, is much used in marketing. That is why, for instance, cars are often marketed for their safety, rather than for their luxury interiors or design. 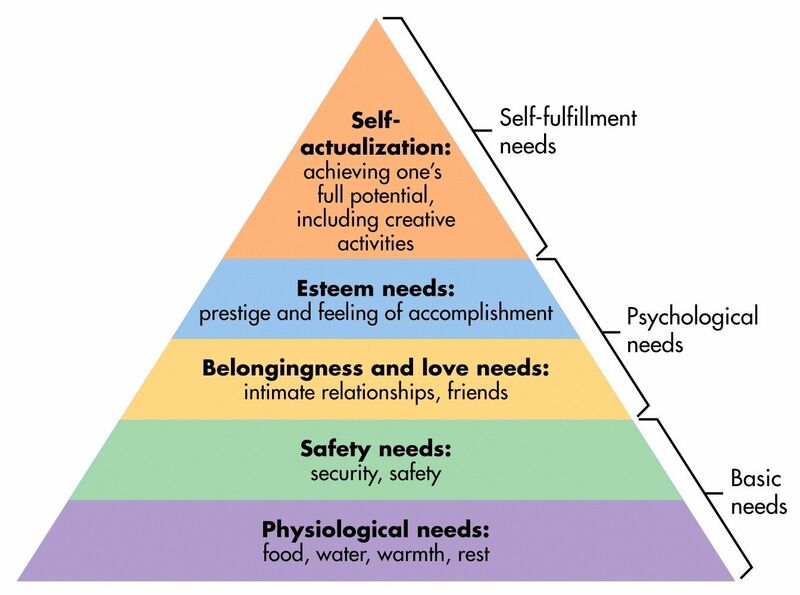 It appeals to your need for safety and security, the second most basic human need, according to the Maslow theory. Fashion, I imagine, is often marketed to trigger your need for belonging, love and esteem. And in the case of fast-fashion, to the urgency of keeping up. Social media escalates that sense of urgency. FOMO, the fear of missing out, feeds on you continuously checking in on social media to see what others are doing. Apparently, you can’t help but compare yourself to others, according to this article siting a study from 2016. Do we all need to unhook from social media? There is a lot to be said for avoiding temptation. What you don’t know can’t hurt you. On the other hand you probably neither can, nor want to, completely shield yourself from the influence of the world around you. If von Busch is right, the desire to shop is not just about the clothes, or the other stuff, you buy. It is an expression of your humanness. We are all social beings and we all want – need – to feel good enough. The weird thing is how that translates into buying things. Take a moment to list twenty things that make you feel good and give you joy. Are there things on your list that do not involve buying stuff? No? Then keep going. Your list is a gentle reminder that there are other, more fulfilling things for you to do besides shopping. Armed with it, hopefully you will build resilience against that familiar pull to buy new things in response to an emotional need. I heard a speaker at a conference once, say that no-one sells products anymore. It is all about selling a service and a lifestyle. Well, what if you pop that lifestyle bubble before the purchase? What does the thing represent to you? What is the actual object you will take home with you, once you have paid? Okay, here are two things on my wish list: a pair of trekking trousers from Fjällreven and a wax-canvas shoulder bag from Ruralkind. Each of these things represent a whole lot more to me than the actual object itself. I look at the trekking trousers, for instance, and I see this healthy, wholesome, energy-filled life with authentic close-to-nature experiences and happy family adventures. But, it is just a pair of trekking trousers. With or without them, I will still be same old me, no more miraculously happy or outdoorsy than I am now. Okay, fine. But actually, I still need a pair of trousers for outdoor activities. Yet, the British-made wax-canvas bag: it is just a shoulder bag. Aah, well. I don’t really need another shoulder bag. What I need is the feeling of being cool, creative and interesting, living a hands-on, craftsmanship-type lifestyle. Another bag, however well-made and beautiful, won’t really fix that. Of course, I can still buy the bag. (Or I could in theory if I had that kind of money.) But then at least I would know why I was buying it and why it probably wouldn’t change my life. Bursting the lifestyle bubble before the purchase, makes it easier to see your real reasons for wanting to buy that thing. Now, don’t get me wrong. It is okay to buy new things. It is also okay to make mistakes. We all buy things for the wrong reasons sometimes. At least I do. Feeling content with what you have is difficult. Not because something is wrong with you, but because you are human and have human needs, both material and emotional. If we want to address an unsustainable shopping culture, perhaps the first step is to acknowledge our humanity?